The solidarity concert for Japan in the Tonhalle on Saturday night was extraordinary. 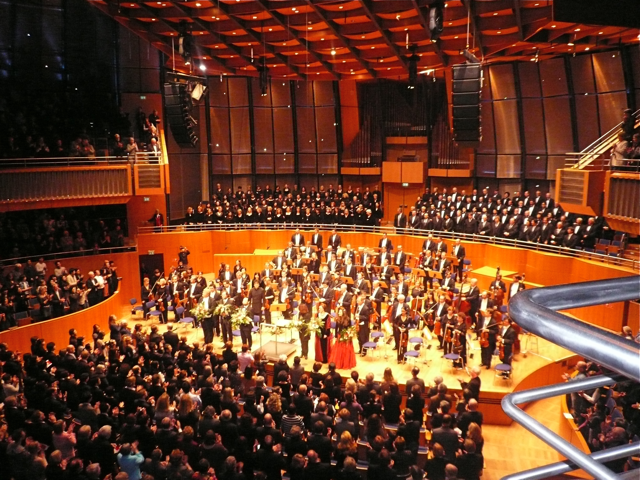 Japanese conductor Yukata Sado led the Düsseldorfer Sypmphony Orchestra along with the WDR Symphony Orchestra, who played together for the first time. They were accompanied by the choirs of The Städische Musikverein, one of the oldest in Germany, and the WDR Rundfunkchor. When the over 120 strong choir sang the final movement of Beethoven's Ninth Symphony, "Ode to Joy" there couldn't have been a person in the totally filled house of 1700, who didn't have goosebumps. It was incredibly moving and very powerful indeed. The Japanese Consul-General and Düsseldorf Lord Mayor led a minute's silence at the end of the spectacular concert and urged Düsseldorfers to make donations to the German Red Cross, the City has begun the fund with €100,000 in solidarity with the 8,000 Japanese who live amongst us here in Düsseldorf. I was fortunate to run into Susan Jones, the chairman of the English Speakers Circle who has been singing with the Städische Musikverein for many, many years ... "Oh we all got together for the first time at 4.30pm this afternoon" she said joyfully. "Went over the bits the conductor did differently and here we now are." Performers are just incredible. I learn this everyday anew with each and everyone one that I meet.